Frankie Stein looks nothing like his parents, Mr. and Mrs. Stein, or the spooky-looking kids at Miss Wart’s Academy for Ghouls & Goblins. His clean-cut looks make it hard for him to make friends. But Frankie knows a thing or two about being scary. He can make grotesque faces, paint bone-chilling pictures, and yelp as loud as a coyote. When he experiments with potions in the classroom and grows two fangs, he wins over the other kids, showing that popularity depends on more than how you look. Once again, Frankie Stein proves that he’s happiest when he’s true to himself. Kevan Atteberry’s digital illustrations lend a hand to this back-to-school spook-tacular story! Lola M. Schaefer has written more than 250 books for children. After teaching in elementary school classrooms for eighteen years, she is now a national writing and educational consultant. She lives in Georgia. - I'm an illustrator of children's books living in the Seattle area. 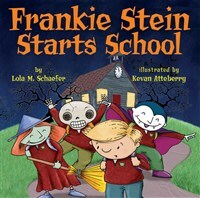 A book I illustrated, "Frankie Stein" by Lola Schaefer, just won the Children's Choice Book of the Year for K-2 from the Children's Book Council. I have another picture book I illustrated coming out in August (Tickle Monster by Josie Bissett) and a middle grade novel I illustrated (Froonga Planet by Bryan W. Fields) coming out in September. I want to illustrate my own stories someday. That means, of course, writing something worthy. . . alas, there is always a kink in the plan . . .